Long gone are the days of calling a restaurant and being put on hold to place your order and then giving your credit card info to some kid you have never met. Today, food delivery apps make it possible to get pretty much anything you’re craving, anytime, anywhere. After a few taps on your smart phone screen, someone is knocking’ on your door with delicious hot food. Best of all, no cash has changed hands. How Do These Food Delivery Apps Work? Today, I’ll focus on how to use Grub Hub and some notes on using UberEats. You will need to set up an account first to use either of these food delivery apps. As with anything you purchase on a smart phone, the cost of your food is charged directly to your bank or credit card account. GrubHub was one of the first food delivery apps and is the one I use most often. As with many apps, it has accessibility issues. But there are some workarounds. For example, the tabs at the bottom of the GrubHub screen do not say what they represent when flicking right. However, if you move your finger along the bottom from left to right, VoiceOver will read the tabs correctly. Once you find a restaurant, double tap on the name and their menu will come up. Double tap on the item you want and then choose from the options for that item, like toppings on your pizza or your burger. On the Item Options screen there is an Add to Bag button. Double tap on that to add the item to your order. Once you have added everything to your order, go to the Bag tab along the bottom and your order info will come up. You can add your tip on this screen. Double tap the Place Your Order button and your food will be on its way. UberEats is probably the most popular of the delivery apps and is very easy to use. It works very much like most food delivery apps, including GrubHub. Start with the list of restaurants then double tap on your restaurant choice. This brings up the menu for that restaurant. Double tap on a menu item then choose the options for that item. Double tap the Add to Order button to add it to your order. The menu bar along the bottom of the screen shows you what you have on your order, and Checkout will appear on that menu bar. Here are some other differences you’ll want to consider when choosing between UberEats and GrubHub. UberEats gives you the option to rate your delivery person and give a tip after you receive your order, rather than when you checkout. The delivery fees in UberEats seem slightly higher. GrubHub gives you more information than UberEats. Depending on your location, GrubHub and UberEats may have different restaurants to choose from, but some may also appear on both apps. If you have an Uber account, you can log into UberEats with your Uber account so there is no need to re-enter all your payment info. Here are a couple of tips to save you time when using food delivery apps. When you find a restaurant you like, double tap on the Add to Favorite. 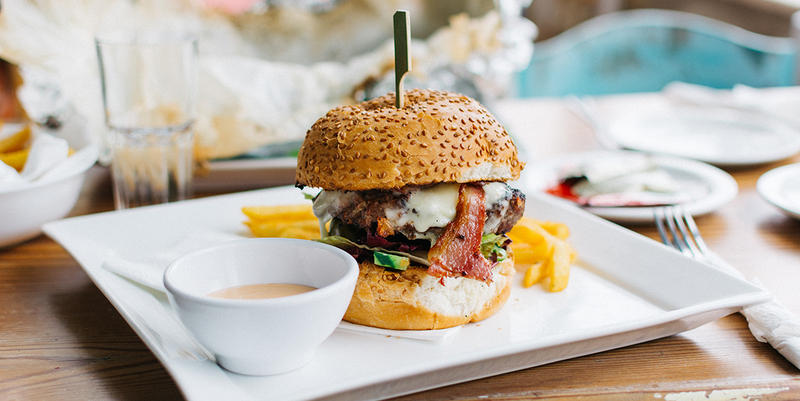 Adding restaurants to your favorites will save you from navigating that huge list of restaurants near you. Just go to Favorites on the main menu and you’ll see those restaurants you marked as favorites. Choose Reorder from the main menu to reorder items you have ordered in the past. This eliminates having to go to the restaurant and navigate the menu to find previously ordered items. Thanks, David, I’m getting hungry already. Next, I’d like to know about apps or other methods we can use for grocery delivery, for those times we need to stock our cupboards or show off our culinary skills. Thanks much. Thanks Jeff! Be sure to attend our InstaCart workshop on Saturday, November 11 to learn more about grocery shopping with your smartphone.